[SatNews] Eutelsat Communications (NYSE Euronext Paris: ETL and the Afghanistan Ministry of Communications & Information Technology (MCIT) announced they have signed an MOU that brings to Afghanistan satellite resources that will enhance deployment of that country's national broadcasting and telecommunications infrastructure, as well as its international connectivity. Artistic rendition, courtesy of EADS Astrium, of the Eutelsat 28B satellite, soon to become Afghansat 1 satellite. Under the multi-year agreement, Eutelsat, at the end of February, will deploy their Eutelsat 28B (formerly W2M) in-orbit satellite from 28.5 degrees East and move it to 48 degrees East to deliver full national coverage and extensive reach of Central Asia and the Middle East. The satellite will be officially called AFGHANSAT 1 by the Government of the Islamic Republic of Afghanistan, reflecting Afghanistan’s entry into the commercial satellite business. AFGHANSAT 1 will support a wide range of services including broadcasting, mobile telephony backhaul and IP connectivity. 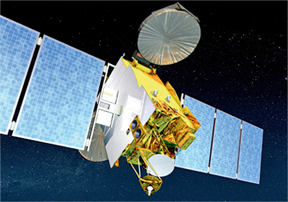 Eutelsat and the MCIT have also agreed on exploring opportunities for longer-term cooperation. Terms of this agreement have not been disclosed by either the company or the country.